Of note in the recent World Potato Markets January issue, was the news from the Chinese Market. There is a clear picture of growth and demand for imported processed potatoes. China has been steadily increasing it’s imports since 2012 and 2018 was a record year with over 190,000 tonnes over their border. NZ ‘s part of the pie, is not small fry for us. 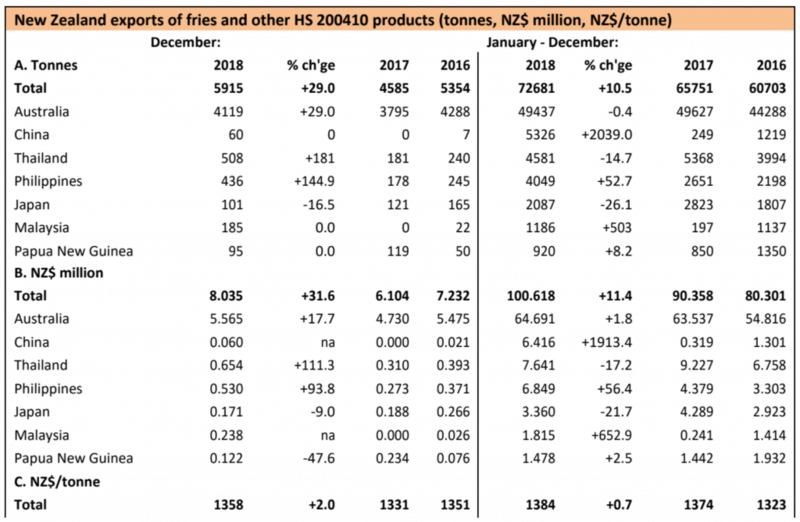 “New Zealand’s early year sales to China this year have helped boost its exports of processed potatoes, making 2018 its second best year on record. 2018’s total of 72 681 tonnes was the first time New Zealand had hit the 70 000 tonnes mark since 2011 and is getting close to 2007’s record sales of 76 386. The sales of just over 5 000 tonnes to China in January and February have meant that China has become New Zealand’s second largest export market. December saw China buy another 60 tonnes and exporters will be keeping their fingers crossed that the same success can be repeated this year. New Zealand’s biggest export market, Australia, recorded a good month in December with sales up from November’s 2 663 to 4 119 tonnes in time for the holiday season. Sales for the year to its antipodean neighbour have plateaued since 2017, which had previously showed a 12% improvement. Better news for New Zealand exporters has emerged from the Philippines where home processors are struggling to make a profit using imports of raw material. Sales for the year have risen by 53% with December seeing sales of 436 tonnes. Relations appear to have improved again with Malaysia. It took 1 186 tonnes in 2018, well up the paltry 197 tonnes for 2017 and better than 2016’s 1 137 tonnes.